Posted by V the K at 6:26 pm - August 9, 2016. A few weeks old, but I have been debating commenting on it and finally decided to comment on it. It was as part of a response to a question about religious liberty. I mean under the guise of religious freedom, anybody can do anything. Back to Mormonism. Why shouldn’t somebody be able to shoot somebody else because their freedom of religion says that God has spoken to them and that they can shoot somebody dead. So, what he is saying is… and he is running as a “libertarian,” mind you… is that if the Government doesn’t force people to bake cakes for gay weddings even if they have religious objections to it, then it’s going to be okay to kill people of other religions in the street. That is just plain shabby reasoning. Reasonably, there is no compelling reason for the Government to force anyone to bake a cake for someone else’s wedding. 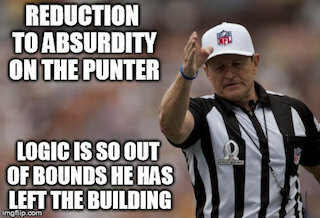 No harm results from such a refusal. The gay in question can simply seek out a baker willing to supply the cake. At very worst, they have to do without a cake. That comes nowhere near rising to the level of murder; where there is a compelling state interest to prevent harm. Can I, in good conscious, vote for someone who really thinks it’s the Government’s business to force people to be nice to each other? I might as well vote for Hillary. I also wasn’t crazy about his support for open borders. (“My vision of the border with Mexico is that a truck from the United States going into Mexico and a truck coming from Mexico into the United States will pass each other at the border going 60 miles an hour. Yes, we should have open borders.”) But between that, his support for wedding cake fascism (and his poor intellectual argument for same), his support for left-leaning Supreme Court justices, and his naivete about the threat of Militant Mohammedanism, I just can’t. Not even if the alternatives are corrupt lying harridan and Trumpster fire. Posted by V the K at 2:52 pm - August 9, 2016. The left’s favorite American Olympic athlete came nowhere close to winning a single medal, but she is beloved because she is a Mohammedan who openly hates America as a racist country. (Hillary Clinton ignored America’s first gold medalist, but was happy to sing the praises of the America-bashing Mohammedan who won nothing.) And the same leftists who mock Mormons for Temple garments worn under their clothing think her hijab (a.k.a. Islamic Slave Collar) is cool and chic. They don’t care about her as an athlete, or even as a person. They only care about her value as a symbol. You may find it odd that the American left has suddenly decided to embrace a religion that unapologetically oppresses women and openly hates gays; a religion that is historically synonymous with the African slave trade. If you do, you do not understand the left. The Democrat candidate for Senate in North Carolina is a former head of the state ACLU who once threatened to sue an elementary school for allowing children to sing Christmas songs at a PTA meeting. The notion that children singing Christmas carols is tantamount to the establishment of state religion is absurd to any rational person. The left’s insistence that non-Christians have their feelings hurt when they hear a Christmas carol or see a Nativity Scene in a public park was the origin, I think, of the whole Tyranny of the Feelings we suffer today. But how can the left thoroughly despise one religion. Christianity, that preaches things left-wingers claim to believe (tolerance, love for other people including your enemies) and embrace a religion, Islam, that preaches intolerance and is antithetical to the left’s self-proclaimed positions on women, gays, and minorities? The foremost motivation of the left is the will to power. And their chosen path to power is through an all-powerful state that completely regulates not just the government, but also the economy, and ultimately the thoughts and interactions of all their citizens. The strain of anti-Christianity runs deep in the American left. This, and political advantage, are why the left and Islam have made common cause. Posted by V the K at 10:23 am - August 9, 2016. A leader of the #BlackLivesMatter hate group is furious that cops are handing out ice cream to children. I am not making this up. Immutable Law of Life: Miserable people don’t want to become happy; they want everyone else to become as miserable as they are. Posted by V the K at 8:54 am - August 9, 2016. 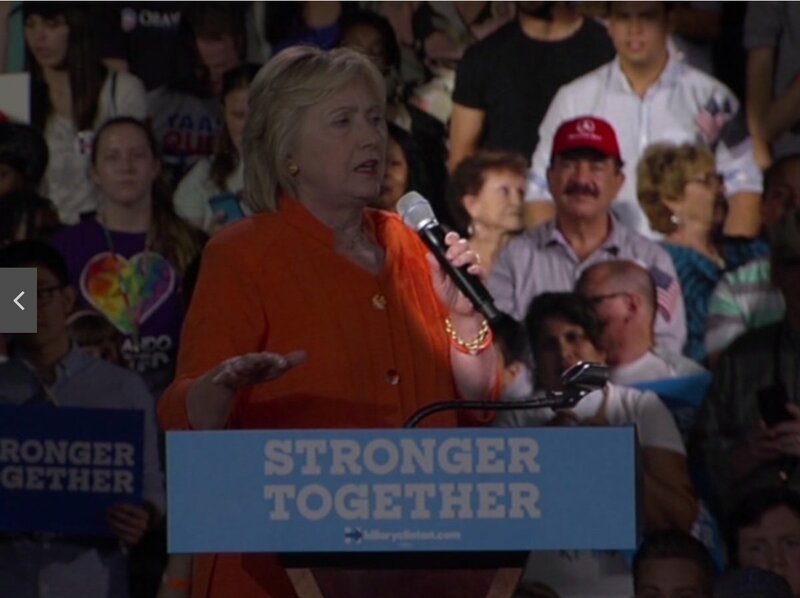 Omar Mateen’s dad is a huge Hillary supporter. Remember how it was supposed to be a big deal that David Duke had endorsed Trump? Yeah, I don’t expect the media to make a big deal out of this for some reason. Question: Do you think the Hillary people are smart enough to have planted this guy in the audience to bait Trump into going off-message on another week-long tirade? Update: The Hillary campaign is claiming the event was open to the public and they had no control over who was attending. And perhaps there are people dumb enough to believe that all attendees at Hillary events are not carefully screened and vetted. Probably the same people who really believed that the $400M Obama sent to Iran in foreign currency in an unmarked jet in the middle of the night wasn’t really a payoff. Incidentally, the New York Times (“Fire Bad!”) openly admits that they are going to do everything possible to make sure Hillary wins. Really, the only difference between this and any other election is they’re open about it this time. Here he is on video. He really likes Hillary’s gun control position. A lot. Posted by V the K at 8:01 am - August 9, 2016. Sean L is on record for saying Olympian David Boudia is a handsome fella. This makes me like him even more.